As I headed off to collect the VANMOOF Electrified for this review I felt a real mix of excitement and curiosity. My current ride is a steel framed fixed gear bike, and whilst I also take my road bike out for the occasional spin, they are both wildly different to an electrically assisted 'e-bike' with an automatic two speed gearbox. Needless to say, I was therefore looking forward to seeing what the VANMOOF could offer at £,1800. For anyone who hasn't seen a VANMOOF bike in the flesh, they are rather impressive to say the least. With a unique, instantly recognisable silhouette, the frame is dominated by a large top tube with prominent welds and a gusset in the front triangle. This industrial theme continues throughout, with a thick down tube, seat tube and rather large chain stays and drop outs. The frame is made out of 6061 heat treated aluminium with an anodised finish in place of paint allowing the natural qualities of the aluminium to shine through. There are some lovely touches in the frame design too. For example the integrated Phillips branded front and rear lights are an elegant solution to lighting the bike in dim conditions and all the electronics are hidden away within the frame itself. These details mean that at first glance you wouldn't think you were looking at an e-bike at all. In fact the Electrified doesn't look too dissimilar to the majority of the VANMOOF range; which is a great achievement on their part. The Electrified's smart features consist of a 250w front hub motor, front and rear integrated lights and a GPS tracking system as standard. This is coupled with an automatic two speed gearbox that shifts up from a very manageable gear at just above jogging pace. 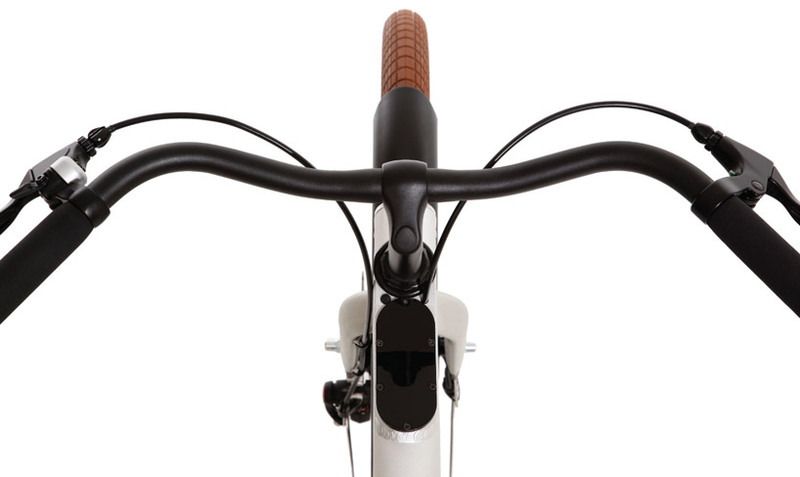 All the bike's electronic functions; the motor and lights, are controlled through a center console embedded in the top tube just behind the stem. It uses a minimal touch interface with two buttons; one that turns the lights on and off and one that toggles the output of the motor. On the whole it works well but one does question whether the touch panel is completely necessary or whether the job could have easily been done with physical buttons. A couple of times I found myself searching for the panel then having to glance down at the top tube to see if I had guessed correctly. If physical, more tactile buttons or switches had been used I could have 'felt' my way around and taken out some of the guess work. That being said, the control panel is a beautiful thing to look at and with this being 'a bike of the future' it was maybe the preferable aesthetic choice. The front hub is linked to the Electrified's on board computer that analyses the riders pace and adjusts the amount of power output accordingly. VANMOOF claim that this combination can improve pedal efficiency by up to 80%. The motor has two modes; full capacity assistance or half capacity. With only two gears the motor isn't going to propel you into the record books but this was never the intention. This system was developed with the urban commuter in mind, giving you a nice push to get up to speed and then keeping you at a consistent pace from there on in. I never felt that the motor was taking over the from my pedaling, but it was never meant to. The power is delivered relative to the effort you put through the pedals – which is spot on. If the motor were to take over it would no longer be a bicycle and the idea behind the electric assistance is that it helps you along while allowing you to concentrate on the joys of cycling. VANMOOF state the battery will last for 30 - 60km on a full charge – depending on conditions such as; rider weight, temperature and geography (hilly or flat). The battery status is displayed through a glowing LED on the centre console with a blue light indicating a full charge and a red light indicating when it's running low. Once you have run out of juice you can recharge the bike through a wall socket with the supplied cable. During my test I did manage to drain the battery completely and experience the bike with no power assistance, which was probably more a reflection of heavy usage and shouldn't be held against it. However, it did highlight that due to all the features hidden in the frame this bike is very heavy, especially for one made out of aluminium. Make no mistake there is a noticeable difference in effort when the bike is powered by legs alone. Without power the automatic gearbox also becomes difficult. Unable to manually choose when to change gear I often found the gearbox would up-shift at inappropriate times such as moving through heavy traffic or when trying to maintain a slower pace uphill. This may seem a little scathing as one of the bikes main selling features is intelligent power assistance, but this bike was not designed to be ridden for long durations without power. With that in mind VANMOOF say that it should only take 3 hours or so to fully recharge the battery - so as long as you remember to charge the bike before complete power depletion it should never be a problem. When charged this is a bike that works really well and fulfils its design capabilities. It helps keep a steady pace and flatters your efforts on the pedals. Whilst it does take a little bit of time to adjust to the feeling of the motor kicking in and surging you forward you are soon welcoming the fuzzy purr of the electric hub. Just in case you are caught out by the power surge, the Electrified is equipped with front and rear disc brakes that provide plenty of stopping power. By the end of the trial the cables on my test bike had picked up a bit of slack, but again this was easily rectified. The cable callipers only needed a quick tighten to take up any stretching that had occurred through use. Even without the electronics this is still a sturdy well thought out bike. Coupled with mechanical discs the chain is covered to keep out any dirt or city grime, the cables are all neatly tucked away inside the frame and the wheels feel like they could plough through walls. The ride is stable and reassuring and it corners on rails, if not especially nimbly. I think that sums up the VANMOOF Electified; it is a uniquely beautiful bike that blends technology with the simple essence of a bicycle in a very contemporary way. Outside the world of bikes technology is working hard at trying to integrate itself invisibly into our everyday lives, becoming habit rather than task. 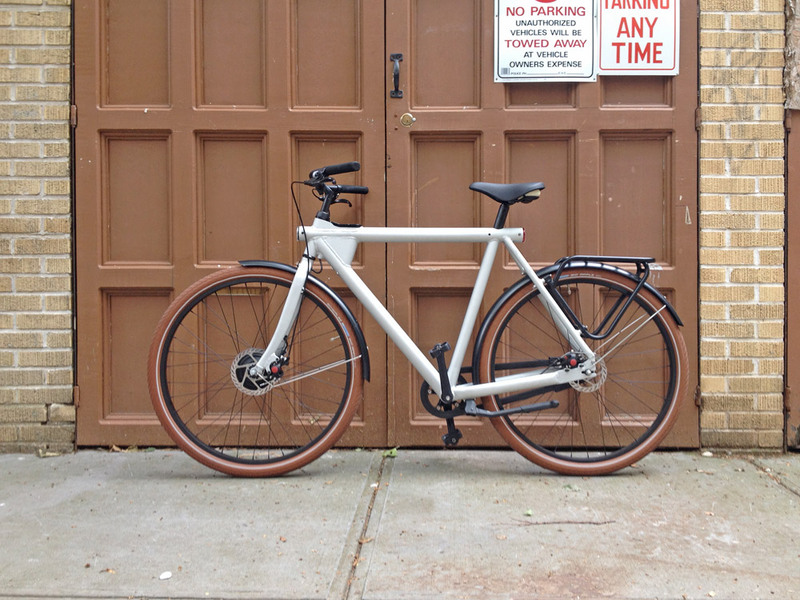 The VANMOOF is the first bike I have experienced that is trying to do the same thing in cycling. There is, and has been a lot of time, energy and tech put into this bike, but for the everyday consumer it may go unnoticed or even un-appreciated. 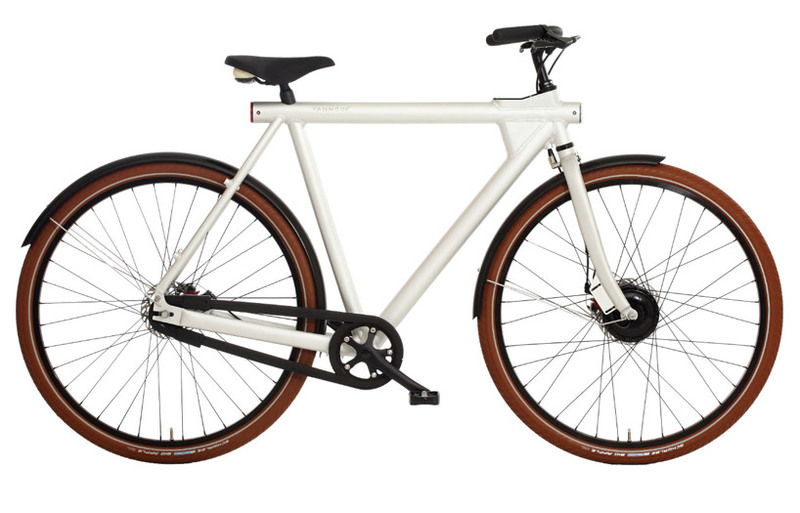 I have struggled trying to place the VANMOOF Electrified into a category, or even a target market. VANMOOF suggest it's for the everyday commuter who wants to ride stylishly with great efficiency, or maybe even the unsure rider wanting an easier introduction to city cycling, but I'm not so sure. There are lighter cheaper alternatives for the everyday commuter, in fact after riding the Electrified I would be seriously tempted by a standard VANMOOF model. Right now I believe the Electrified is for the early adopters, the people who must have the latest thing right now. The Electrified is a fantastic first iteration of what a smarter city bike of the future could be, just as the first smart phones were great first iterations of what we now take for granted. Maybe the Electrified will act as a catalyst and we will soon see a massive surge of people buzzing around the inner city on power assisted bikes. We can only hope. It is without doubt a fantastic bike, and I have thoroughly enjoyed my time with it. It is well put together, beautifully styled machine and that is something VANMOOF should be commended for; boldly taking a step into the future and doing it well enough the first time for people to sit up and pay attention.